Today I'll share this secret recipe of Egg Devil which is also popular as a street food in Bengal. 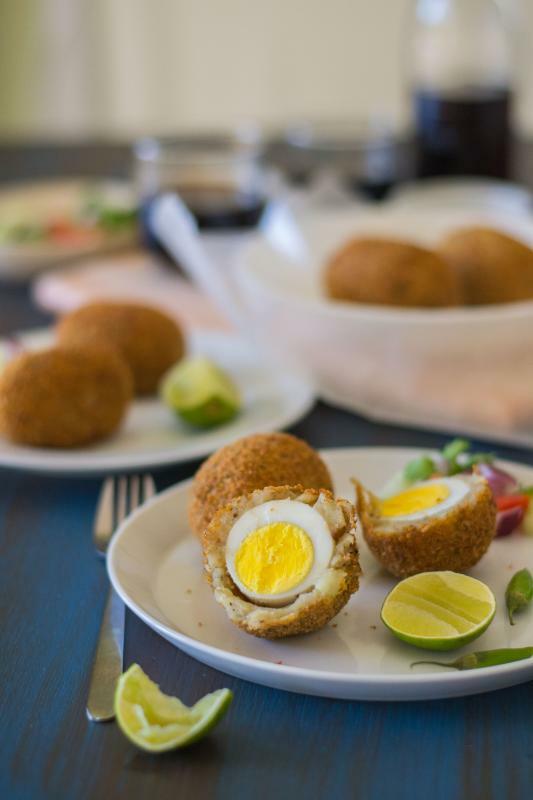 Egg Devil is actually result of the influence from Mughlai Cuisine, introduced to Bengali Cuisine in the early eighteenth century. It has several different procedures to make. Sometimes it is made with boiled half egg when yolk is taken out. Then mix it with the potato mixture and place back in position. Give it a shape of full egg with the potato mixture and then dip in egg wash. Roll in the bread crumbs and finally deep-fry it. There is another version of the same dish when you can use either the half of a boiled egg or the full one. Then cover the egg with potato mixture, dip in egg-wash, roll in bread-crumbs and deep-fry it. This version is the most popular and usually found in any restaurant in Calcutta or street-side stalls. Today I will follow the same version. 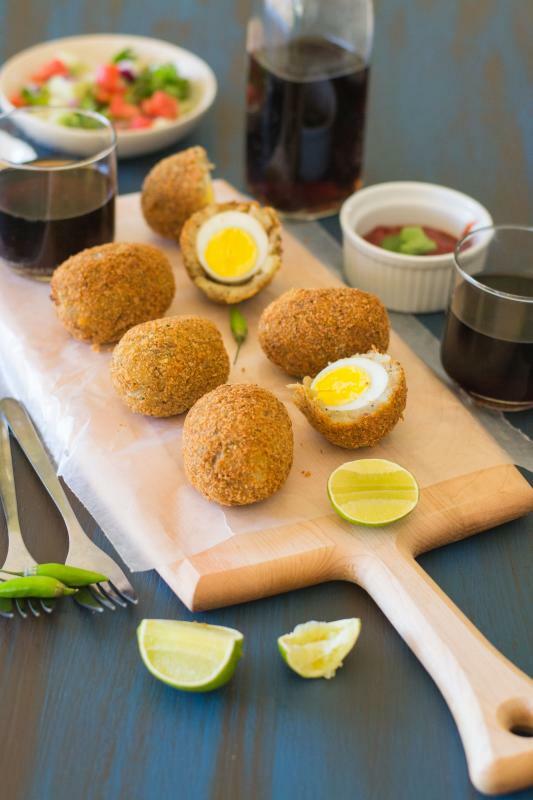 This is very similar to Scotch egg, while Scotch egg consists of a hard-boiled egg wrapped in sausage meat. Only difference is that our Egg Devil is wrapped in potato mixture. 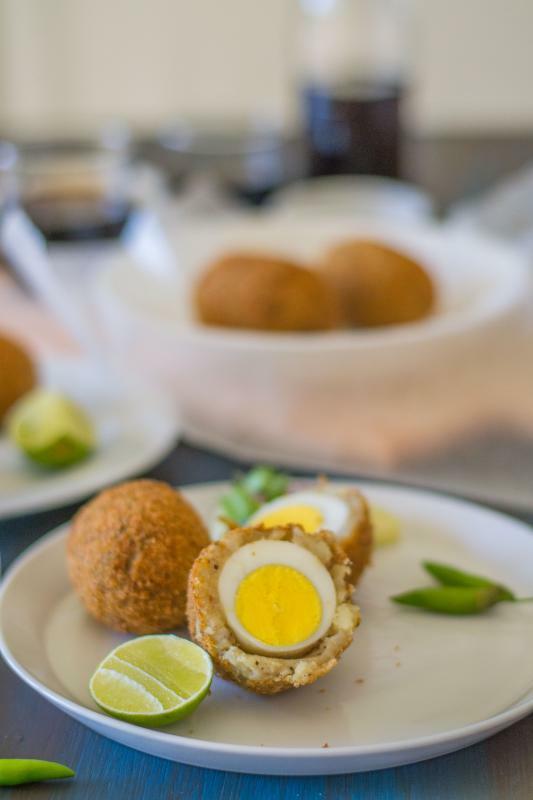 You can serve this Crunchy deep-fried Egg Devil either as a snack or an appetizer with your favorite dipping sauce. It goes well with kasundi (zesty mustard sauce) and with some salads. For Roasted Spice Powder - Take a tablespoon of cumin seeds, and a whole ( or half as per tolerance) dry red chili. First dry roast it till it becomes fragrant, then grind them into a powder. 1. Take a pan, add oil and heat it up, once oil is ready, add onion. Saute the onion, til it is light brown, add salt to it. 2. Add the garlic paste and stir it until raw smell goes off. 3. Add the boiled and smashed potato to the pan, add salt, stir it and mix it well. 4. Add 1 tbsp of Roasted Spice Powder ( bhaja masla ) and again give some stirs. Check seasoning and once potato is enough dry, turn off the gas. The Potato mixture is ready, set it aside and let it cool down at room temperature. 5. Take the boiled egg, cut into two vertical pieces. If you want to make the devil of full egg, don't need to cut it. 6. 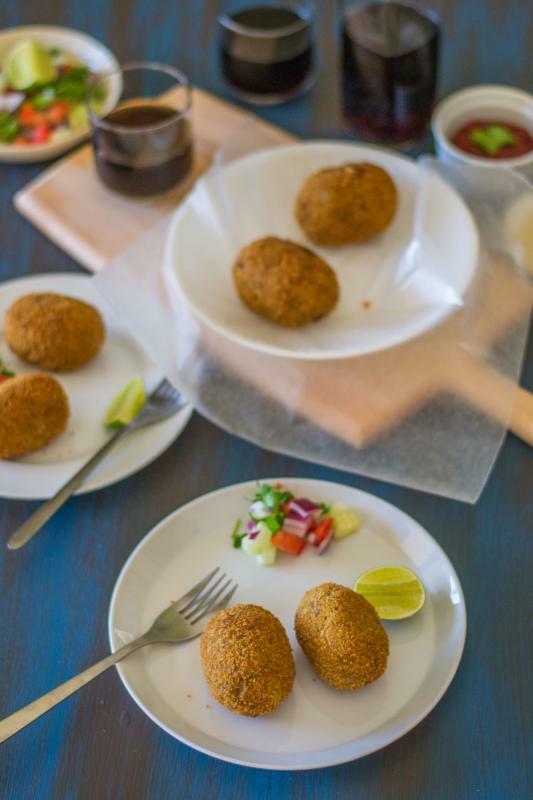 Take a piece of egg, cover it with the potato mixture and give it to an oval shape. Repeat the process for the rest of the eggs. 7. Make the egg wash by whisking the egg with 2-3 tbsp of water to have a smooth consistency. Spread the bread crumbs on a flat surface. 8. First dip the potato mixture coated egg in the egg wash then roll in the bread crumbs. 9. Repeat the same process for all the eggs and make sure they are well coated with bread crumbs. 10. Heat oil in deep frying pan. Once it's ready, fry them one by one at medium temperature till they get nice brown color on the both sides. Take them out from the pan and place on a paper towel to absorb the excess oil. 11. Egg Devil aka Dimer Devil is ready!! Serve hot with mustard sauce( kasundi ) or your favorite dipping sauce and with some salad. 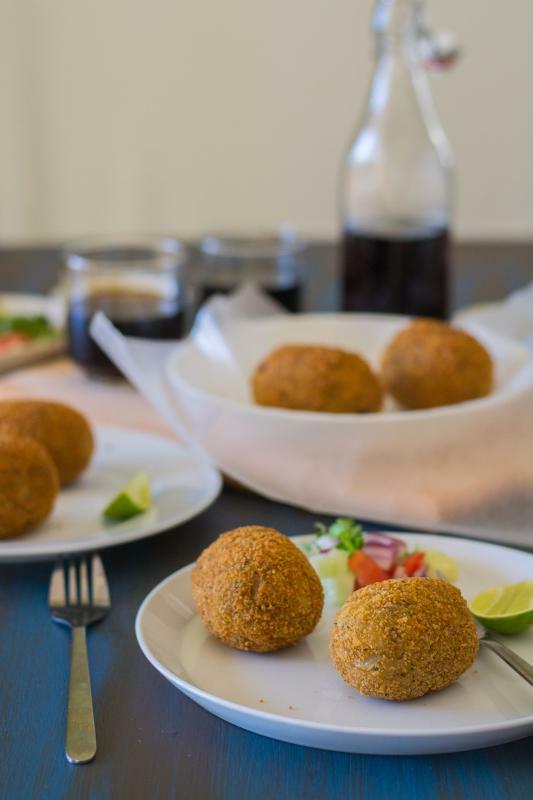 Note : If you want to avoid deep frying method, you can bake it at oven, for baking method click here, go to the 'Method' and follow 11th and 12th steps. Your eggs look perfectly fried and yummy. I'm always a little apprehensive about frying eggs, just that it might burst on me...I might try the baked version. These look insanely good! I've never had anything like it, but the flavors sound delicious. I think I need to try making these sometime! All your recipes are mouth watering.. Go Rumela !! And keep it up the good work.. Very nicely done, and the pics are so tempting.. good job ! It looks tasty. Quite unusual, in any way. I think that I'll try to cook it when I'll get some time for it. I am starving for something new.